“Iron O’Brian” and “Don’t Settle: How to Marry the Man You Were Meant For” cited by the judges. Author Solutions is pleased to announce that two books published through two of its supported self-publishing imprints, Balboa Press and iUniverse, received recognition at the Independent Book Publishers Association prestigious Benjamin Franklin Book Awards. 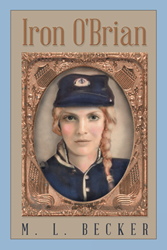 “Iron O’Brian,” which was published through iUniverse was named a Gold Winner in Fiction: Historical and a Silver Winner in Fiction: Romance. This is a historical tale of death and rebirth as a Civil War nurse journeys from the darkness of grief to the horrors of battlefield and beyond as she learns about love and — most of all — herself. “Don’t Settle: How to Marry the Man You Were Meant For,” which was published through Balboa Press was named a Silver Winner in the Self-Help category. The book authored by Scott Carroll tells readers how to “marry” science with spirituality and use neuroscience, genetics, behavioral science and psychology to attract the perfect man for you and get him to the altar in as little as a year. This year’s esteemed indie book award program recognized excellence in books published during 2016. From close to 1,400 entries, one gold and one silver winner was named in each of fifty-five categories. Over 150 librarians, booksellers and design and editorial experts judge the books submitted to the IBPA Benjamin Franklin Award. The judging process begins in September and goes to March each year. Author Solutions, LLC, is the world leader supported self publishing. Author Solutions’ leading self-publishing imprints — AuthorHouse, iUniverse, Palibrio, Trafford Publishing and Xlibris — have helped more than 200,000 authors self-publish, promote and bring to market more than 275,000 new titles. Through strategic alliances with leading trade publishers, Author Solutions is making it possible to develop new literary talent efficiently and provide authors with a platform for bringing their books to market. Headquartered in Bloomington, Indiana, Author Solutions’ global reach includes imprints developed specifically for authors in Australia, New Zealand, the United Kingdom, Singapore and India. For more information, please visit authorsolutions.com. For the latest news, follow @authorsolutions on Twitter and “Like” us at facebook.com/AuthorSolutions. Founded in 1983 to support independent publishers nationwide, the Independent Book Publishers Association (IBPA) leads and serves the independent publishing community by providing advocacy, education and tools for success. With over 3,000 members, IBPA is the largest independent publishing association in the U.S. Its vision is a world where every independent publisher has the tools and knowledge needed to professionally engage all aspects of the publishing industry. For more information, visit ibpa-online.org. The Benjamin Franklin Book Awards are administered by the Independent Book Publishers Association (IBPA) with help from over 150 publishing professionals, including librarians, bookstore owners, reviewers, designers and editors. All entrants receive direct feedback from the judges, which is sure to help guide future publications. For more information, visit ibpabenjaminfranklinawards.com.